Arrive at least 5 minutes early so you have enough time to park and get to the swimming pool. Have your child go to the bathroom before they enter the pool. Taking time during the lesson to go to the bathroom takes away from their learning. Have your child dressed in their swimsuit and by the pool ready for their lesson a few minutes before their lesson time begins. Do not disturb those that are having a lesson. Please do not have your child eat right before their lesson. Your child will work very hard for their allotted 25 minutes. Eating right before can cause cramping and vomiting. If your child is in diapers, swim diapers are required. Swimming shoes are not allowed for beginning swimmers. Goggles are only allowed for those swimmers who have passed the Goggle Swim Test. This test shows the instructors they can swim safely without goggles if they were to fall in a pool. Girls, please pull hair back in a rubber band and clip all hair back that may get in eyes, mouth or nose. Arrange your schedule for these 8 days to attend each swimming lesson. These lessons are private, one on one lessons. There will be 2 to 5 instructors in the pool at a time teaching other students. Please come with your child on the first day so that you can fill out some paper work on them. Click here for our make up policy. It is normal if your young child cries the first few days! If your child cries, the best thing to do is to go sit on the steps, in your car, on the lawn, or somewhere where they cannot see you and you cannot hear them cry. The crying is definitely harder on the parents than it is on the child. For young children, the water, a new instructor, and new surroundings can be scary at first. After a few days the crying will stop and great improvements in their swimming ability will be made. 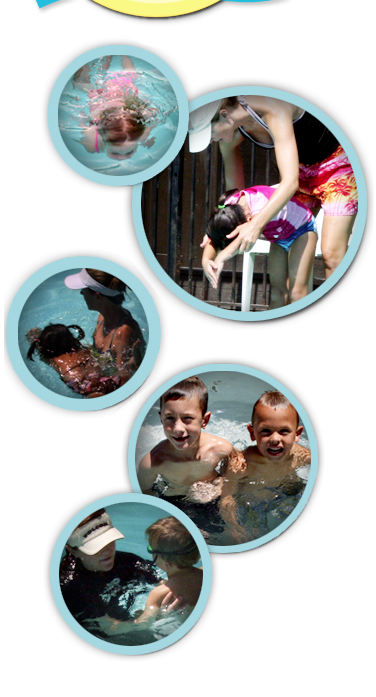 In the end, it is worth a few days of crying to have your child water safe and swimming! Lesson time is 25 minutes. They work extremely hard all 25 minutes. 2-5 instructors will be in the pool at the same time each teaching their own swimmer. Your swimmer stays with their assigned instructor for all 8 lessons. There is NO swimming in the pool after their 25 minute lesson. It has become too disturbing to others taking lessons and too dangerous. Parents if you leave or hide during lessons, please be back at the edge of the pool 25 minutes later. Once lessons are over we are no longer liable to babysit your child. No parents or siblings of students taking a lesson are allowed in the pool during that lesson time.